Your child’s baby teeth are important. Children need strong, healthy teeth to chew their food, speak and have a good looking smile. Baby teeth also keep a space in the jaw for the adult teeth. If a baby tooth is lost too early, the teeth beside it may drift into the empty space. When it’s time for the adult teeth to come in, there may not be enough room. This can make teeth crooked or crowded. Certain problems such as trauma or discoloration of the teeth may require immediate attention during infancy. However, it is generally best to have the first dental check up by the age of 2 1/2 with regular visits every 6 months thereafter. 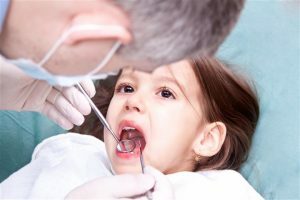 At the first visit, the child’s mouth is examined and X-rays may be taken. It is desirable to have the teeth cleaned and a fluoride treatment performed. At this time the doctor should discuss with you any questions that you may have regarding oral hygiene, nutrition, and available preventive techniques. 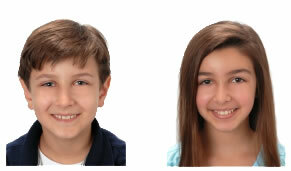 Parents must be present for their minor children’s visits and subsequent treatments, if needed. After each feeding, wipe the baby’s gums with a damp washcloth or gauze pad. Begin brushing your child’s teeth when the first tooth erupts. Clean and massage the gums in the areas that remain toothless and begin flossing when all the baby teeth have erupted, usually by age 2 or 2 1/2. Never allow your child to fall asleep with a bottle containing milk, formula, fruit juice or sweetened liquids. If your child needs a comforter between regular feedings, at night, or during naps, fill a bottle with cool water. Never give your child a pacifier dipped in any sweet liquid. If your local water supply does not contain fluoride (a substance that helps prevent tooth decay (cavities), ask your dentist how your child should get it. Do not let your baby drink out of your glass. Do not share utensils with your baby. If you notice any stains or dark spots on your child’s teeth call your dentist for an examination-no matter how old your child is.